I loved the idea of this book--a novel told from the perspective of a 6-year old girl in 1960's South Africa--but I had a hard time really getting into it. It may have been that I read it during a time when I had a lot on my mind, or it may have been the wandering style in which it's written, but I often found myself distracted from the words on the page. The setting was great and the novel offered some interesting historial insight but overall, I found the plot a bit lacking. It was good, just not fantastic. I made to around page 75 before I gave up. I just couldn't follow the story between the all the South African words I was confused as to what they were referring to (no clue there was a glossary in the back-stick it up front!) and the narration by a six-year-old. Lizzie's narration is so disjointed and choppy that I just couldn't stand it anymore. I really didn't like having the voice of a kindergartener narrate what I'm sure would be a compelling story of growing up during apartheid. This book really pushed me to learn more about South Africa, and I loved it for that. However, I did not enjoy reading from a small child's perspective. Also, this book frequently dragged for me. And I just couldn't love the characters. That makes it harder to enjoy a book. The overall story was good though, and worth reading. I think this is a book for avid readers, not reluctant or occasional readers. I struggled with the first 100 pages of this book. I have to be honest, I was ready to put it aside, but my book club colleague who had chosen the book urged me to stick with it. I was glad I did. A tale of apartheid in South Africa, Ms. Gien is at her best when the characters have dialogue. This may be due to the subject being a play the author first and then a novel. She seemed determined, in that first 100 pages, to describe to the smallest degree the setting, time and place as if it were stage instructions. Once we got past that and into the actual story, the book took off. I kept wondering why I knew so little of South Africa and the apartheid situation there in the '60s. I knew of Nelson Mandela and that they struggled with civil rights, but this book really opened my eyes. Although I struggled, I'm glad I finished it. Not written for an American audienceThe language was difficult to understand because of the different dialect. There is a glossary at the back of the book which most of us didn't discover until we'd already struggled through most of the story. And as one member of my book club pointed out, there is a problem if they have to put a glossary at the back of the book. The narrator is unconvincing as a six year old girl. The writing is very random and sporadic. The book is full of non-essential characters. I wouldn't recommend this book to anyone. It is definitely written for a South African audience. Another book group selection and, with the exception of one person, we all hated this book. It was an Oprah Book Club choice at one time, and we normally don't chose those. But this book was highly recommended. Oprah described it as "inspiring and uplifting". I must say that this was one of the most depressing books that I have read in ages and I only finished it because it was for my book group. If there was anything "uplifting" in this book, for the life of me I don't know what it could have been. The first 100 pages or so of this book were a bit monotonous which made it easy to put the book down. It finally got interesting at about 150 pages. Would I recommend this book….umm, probably not, even though I gave it 3 stars. If you like books about South Africa, then I would recommend two books (true stories) by Alexandra Fuller, "Don't Let's Go To The Dogs Tonight" and "Cocktail Hour Under The Tree Of Forgetfulness". An eye-opening tribute to South Africa. Pamela Gien writes beautifully about Apartheid and the relationships of South Africans to one another through the innocent eyes of a young white girl who doesn't understand the seriousness of what she is experiencing in her childhood while under the care of her black nanny Salimina. A beautiful goose-bumps raising read. This book definitely grew on me. It started out slow with, what I thought, was too much description. But the scenery and lifestyle melded into the tale being told. The end portion of the book moved me to tears, as I had come to live with them in their Africa. It is especially poignant today when the U.S is such a divided country. The Syringa Tree was about a white family in South Africa who was different than most families. They treated thier servants like their own family and both had respect for eachother. Lizzy was the main character and the oldest child of the Grace family. She was put through alot of hardships throughout the book that included watching the head servants infant and keep her safe and secret from the police. She had a father who was a doctor who secretly helped blacks and whites in the same business and would make house calls at all times of the night. Lizzy lost her servant, Salamina, when she was 11 years old and considered Salamina to be a second mother who did not say good-bye. She dealt with the death of the servants child when she found out in a newspaper. The child was only 14 yrs old and she felt responsible for not keeping her safe. Lizzy grew up to be a strong independant women with a good family. The live over in America. The book ends with her returing to South Africa to find Salamina and to make peace with her homeland.It is differently culturally from America because of how serious the Apartheid was and what took place on it's homeland. Their were many killings of children who were unprotected and discrimination of races that produced proverty country wide. The authors purpose in writing this text is to show the perspective of a white child growing up in South Africa and how she did not agree with her surroundings but could do nothing drastic to change anything. The evidence that supports my conclusion is that she explains many times how Lizzy thinks it is unfair and how the government/ police were not to be trusted. At the end of the book all she wants to do is get out of the country because she can not stand it anymore and how it was getting worse by not changing any of its policies. The theme of the text is to create a history based storyline. It had facts about the country and also combined the life story of lizzy grace and how she grew up in the hardships of South Africa. I would recommend this text to anyone who likes to read heartrenching books that makes the reader become open minded about their own life story. This book has alot of detail and facts that will be easier to understand if researched before reading the book. It is a moving book and I recommend reading it. This is absolutely the best book I have read in a long time! It seemed to reach in and grab me and never let go. It's the story of South Africa in the 60's, as told through the eyes of a young white girl. It is the tragedy of apartheid and the triumph and strength of human spirit over the pain and despair. It is also the most honest book I have read about this time period in South Africa's history. What I loved too was the memories it stirred up - the names of things I had long forgotten, the beautiful descriptions of the Highveld, the maid's bed on bricks to keep the tokoloshe away! It was brilliant!The words penned by author Pamela Gien as the main character, Elizabeth, returns to South Africa for a visit, after living in America, rang so true to me. I've experienced this very feeling ... "We began our descent into Johannesburg as the sun was setting, sealing the red-rimmed sky with the fiery fragrance of African smoke and earth. As we walked down the steps of the plane, I filled my lungs with it almost to crying. Now I knew, I said, laughing at myself ..., why exiles kiss the earth upon their return". This is a book I would recommend to anyone. You don't have to be South African to enjoy and appreciate this excellent book! IT Ended up being a little hard to follow. It was well written and an interesting story. IT might be because it was a play first and then she turned it into a novel. Because of the flow of it I gave it three stars but these are the things I liked about it ... Also there is a glossary at the end. I wish I would have known that when I started it.I just started this book and am only on page 50 but it is so descriptive I love it. I'm having some problems getting through all the South African terms but once I figure out what everything is it will flow better. Here are some examples. "He was so burnt you might have thought he shot up to the sun for his bath each morning." Here's another, "The syringa tree rose from the ground at the back of the property. Its golden berries followed syrup-sweet clusters of flowers exploding from its branches like suspended meteor showers to release their fragrance into the air-tiny star-shaped blooms, from palest lilac to the deepest purple, like the inside of someone's heart. Its shadow was generous, its roots black, gnarled, and deep." It's really beautifully written and I like the characters but I'm not very far along yet. Although I always wanted to read this book, I was concerned when I read the dust cover that it might be something like The Verwoerd Who Toyi-toyied, where the Afrikaner is made out to be evil incarnate. I was pleasantly surprized. The book is wonderfully written with the most beautiful descriptions of the way life was experienced by the story-teller. The cultures and beliefs that were not clear and of which the story-teller had no first hand experience were not slandered (as the current trend in writing - in an attempt to be politically correct? ), but rather told from the storyteller's perspective and view point only, without judgement. I could not put the book down, not only because of wanting to know what happens, but also because of the wonderful way the writing takes you to experience another world, how it makes you feel what the storyteller is feeling. I enjoyed reading the book tremendously. An interesting story about growing up in South Africa in the 1960s and 1970s. Elizabeth Grace is the daughter of a doctor, Isaac, and a beautiful but depressed mother, Eugenie. She is cared for by a household of black servants, but especially Salamina. She is a privileged child, but not Afrikaans, so she is considered inferior to her next door neighbor Loeska and other blond, blue-eyed Afrikaans people. As laws segregating people become more strict, racial tensions accelerate and violence increases. Salamiina has a baby daughter Moliseng, who must be hidden because she has no papers to allow her to live with the Graces in Johannesburg. If she is found, she'll be taken away from her mother and sent to live in the township of Soweto. Lizzie's "job" is to keep track of Mollie and make sure she is hidden when she needs to be. Exquisite. The syringa tree has different meanings and is used in different ways throughout the novel. Well-developed story told from the pov of a young Jewish girl growing up before and during Apartheid in South Africa. Her family is not Afrikaans, so she is not fully accepted but still privileged as a white person. There are so many dimensions to this tale: Lizzie's loving relationship with her nanny, Salamina and Salamina's daughter, Moliseng, whom it is her job to protect; her desire to be friends & playmates with the Afrikaan girl next door; her closeness with her father and grandfather; her troubled, fragile mother. The author skillfully weaves them together in a captivating tale that reveals the beauty, the tragedy and the challenge of South Africa. Haunting and hopeful. This book will stay with me. The first 80 pages or so were tough for me to get through, and I almost decided to put it down and forget it. I read a review on here though that recommended sticking it out, and I'm glad I did. I do wish, however, that there had been some indication at the beginning of the book that there was a glossary in the back. It took me probably until about 70 pages or so into the book to realize it was there. There were a lot of words unfamiliar to me used, and it is one of the reasons I was getting frustrated with the book. Then I discovered the glossary and found it helpful. Like I said, I just wish there was some little note about it at the beginning of the book, so I would have known it was there. Also, if I had been reading on a Kindle, I'm not sure I would have discovered the glossary until I got to the end of the book. This is the beautifully-told, but painful, story of a family caught up in the pivotal time of change in South Africa. When external reality is painful, the little girl at the center of the story escapes into the syringa tree. As the tyrany of apartheid grows, she finds others escape there, too -- black South Africans scramble up into the sheltering branches in flight from the searchlights of the police. The parents and grandparents in this story, based on the author's own family, are truly admirable in their attempts to fight the inexorable.Author Pamela Gien, who has a related Obie-winning play, gave an interview including some riviting dialect readings, on Diane Rheam: http://wamu.org/programs/dr/06/09/04.php. I received this book as a present from my sister and had no idea why she gave it to me. I chose it as my book to read on the train to work, but without much interest.It isn't one of those books that I suprisingly love but the story and the way it was written was enjoyable.The girl Elizabeth was, her thoughts, family and what she experienced in life were written in a not boring, read it already way. This story is about Afrika, just before the Apartheir started to be mentioned. And even though the well known struggles, problems and way of living is part of this story, the author never pushed it to become central. There was a different story told and all the previously mentioned things were just part of it. LOVED it. What a remarkable tale of growing up in South Africa during apartheid... it inspired me to research the history of South Africa (at a Wikipedia level, for the moment, but perhaps at a Michener level soon ;) And by the way, apartheid only ended in 1994. Good grief; I'm embarrassed I wasn't absolutely incensed throughout my life, but instead I was blissfully ignorant in that my-goodness-that's-far-away-and-foreign kind of way).I find myself thinking about this book regularly, which is, to me, a powerful endorsement. If I keep thinking about it, It GOT to me. This book truly had Something To Say, and I'm very glad I read it. It's also a page-turner. So that's a great combination. I first read this book in high school and have read it about a half-dozen times since. There is not one time (even though I know exactly what is about to happen) that the it does not bring tears to my eyes. And I am definitely NOT the type of person who usually cries at books or movies. Elegant writing, complex heroine, essential cast of supporting characters and a love story for a homeland that is imperfect, but still home.I would recommend this to (young) women, anyone who has every left a country behind or anyone interested in history. But, I am sure, anyone who picks it up will find something or other to relate to in The Syringa Tree. 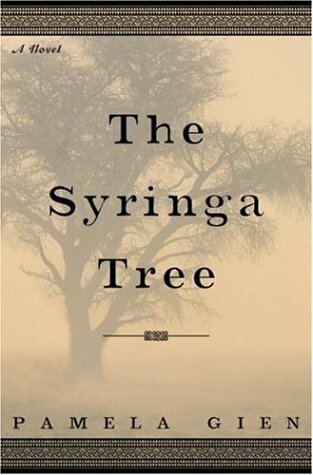 The Syringa Tree by Pamela Gien is set in South Africa during apartheid. Lizzy’s Dad is a doctor with an office that serves whites in the front waiting room and blacks in the back, an arraignment distasteful to the kind man. Lizzy is nurtured by Salmina, a servant in the household, adored by her grandparents who live on a remote farm and held in the bosom of her family. Lizzy is delighted when Salmina has a baby, Moliseng, and she is put in charge of keeping the baby hidden. Salmina has a permit allowing her to stay at her employer’s home, but the baby is not allowed. Moliseng would be taken to the Soweto ghetto if discovered. Hide away, hide away, Moliseng must hide away good. This is one of those books where you think, amazing story, amazing place, evocative writing--so why do I feel so bad? Gien does such a good job of making the reader feel the dread and fear and beauty and ugliness of growing up in South Africa during apartheid that I was tempted to put it down. But I didn't, I'm glad I didn't, and you should read it. It's a fascinating read about a fascinating (but painful) time. And, of course, we know that things do improve for some. Others become statistics and headlines. Facing this kind of thing, though, is the only way to be in any kind of position to inch the world to what it should be. Thanks, Darcy, for giving it to me. Although this book started off rather slowly, and I wasn't sure that I would get into it, I did find myself liking it about halfway through. Elizabeth is a young white girl in South Africa, whose family employs black servants, and is in the midst of new government and apartheid. It was very interesting to hear her point of view, as a child, and then how she finally gives up on South Africa and emigrates after university. One aspect that really turned me off at the beginning of the book was Gien overuse of Afrikaans vocabulary, as I felt that I was missing large chunks of information. This is my 4th book I read this year (2011) and I read it for book club. Would have rather read the play --- first 100 pages were tough to get into --- not a lot of action, and I think the play would have had more action ---overly descriptive, tree images are nice . They hid blacks in the tree (title) nice relationship between little girl and her nanny Sallamina, and I liked the ending --- shows the Brits are in the middle between blacks and whites (apartheid in Africa) --- book takes place in Johannesburg, SA or areas around there. Fiction about the apartheid in South Africa. Would have been better if a) I had known something about the apartheid before reading it (I was getting lost in some of the terms that were being tossed around. The book assumed you knew what was going on historically). and b) if the main character was an activist. I felt that the book was sort of like: "well, bad things are happening. Here's a couple of stories about it. Now lets have our hero flee to America and not come back until everything is better". I thought this book was beautifully written. The narrator is six year old Elizabeth Grace and the author captures the voice very well with all the magical thinking that is part of childhood. The setting is South Africa during the 6o's and through the various characters white and black we are given the story of the struggles of the country. Thanks to my sister Marlene who gave this book such a good rating that I was encouraged to pick it up. It isn't often that a book brings me to tears, but this one did several times. Lexis I am saving this one for you. I cried many time while reading "The Syringa Tree"...Africa retains a large piece of my heart after living there for 4 years. I left in 1985 to return to the US but that piece of my heart is still there and calls to me more strongly each year.A novel filled with the reality of family lives during the era of apartheid: the loves, the losses, the hopes of all. I read it on a NOOK so my tears didn't dampen the pages but they did fall. Before I found the glossary at the back of the book, the terminology used was difficult for me to understand. However this novel was inspiring because I learned things about Africa that I did not know before. It is a story about two families, one black and the other one white. They were separated by racism in the era of apartheid. Even though it is a novel, Nelson Mandela and his imprisonment is partially told in this story. As I read the end of this book, it was through tears.